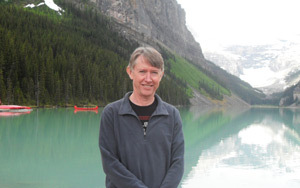 Pannell Discussions » 301 – Inequality in the USA » Ideas in economics, environment, policy and more. Posted on 14 November, 2016 by David Pannell. This entry was posted in Latest, People, Policy, Politics, Social issues. I saw the very same graph and was questionining my economics logic. As economists we were led to beleive that free trade will lead to prosperity. The US was considered the altar of free trade. Yet we all know the other side of the story and driving lower wages, poor conditions of employment, low quality standards, deals that encourage collusion and anti-competitive behaviours and those that do not take account of externalities are deleterious to economic and social well-being. What has progressively occured in our own backyard has some similarities but fortunately not as bad. Isn’t it time we drop the phrase Freet Trade for negotiated preferential agreements where the more powerful gets the lion’s share, and resort to basic economic logic of truly efficient allocation of resources and work on those factors that prevent us achieving efficient outcomes and then addresss those sources of inequity. Some Nordic countries already do that, I guess. I think Thilak has hit on the root cause of this result. People finally fed up with the ‘elite’ (read big corporations and historically wealthy) getting the lions share of the goodies, and with Hillary offering no obvious change to this status quo. They wanted the promise of radical change in wealth and welfare distribution (no matter how unlikely it actually was) and ironically thought an elite billionaire was more likely to deliver it. That and the fact some polling figures suggest only about 20% of people actually voted for Trump – a result of non-compulsory voting and their College Electoral System whereby each state has a weighted number of seats going toward the 270 required to become president. Win the heavily weighted states and you can become president without actually winning the popular vote. Apparently around 2010, the Republicans made use of new mapping technology/data to make some boundary changes on electoral maps which ensured they won the states with the high weightings, while the Democrats watched on oblivious. A Gerrymander situation it is alleged. Actually the US electoral college system is not that different to what we have in Australia: each State has a population-weighted number of seats in the House of Reps, and the party with the most seats forms government and their leader becomes the PM. Hence, by focusing on marginal seats (think States if you were in the US) Howard was reelected in 1998 despite losing the popular vote to Beazley. The trouble with the US is that Americans immediately become defensive if non-Americans criticise their homeland. I don’t know what this guy is all about. He talks about the unequal society that is America, and the “voices of reason, balance, kindness and openness within the country” which have voted for or tolerated all this inequality in the past. So the good guys are the ones that brought about the problem, and the bad guy is the one who says he will fix it. Ignoring whether he can or will, I cannot see that the so-called “good Americans” have anything to offer. In fact, they have not been very good at all. Another blinded-by-prejudice rant by one of the privileged classes. This sort of illogical thinking has contributed to the problem. First, the assertion that “voices of reason, balance, kindness and openness within the country” have voted for or tolerated all this inequality. That is simplifying an incredibly complex social and political issue down to partisan nonsense. Secondly, “ignoring whether he can or will”! You can’t ignore that. The chances are he’ll actually make matters worse for the people who voted for him (similar to Brexit), and do enormous damage on many other fronts. I think you should get up to date with the facts on Brexit, David. A good up- to-date source is a BBC site and given their political leanings are the same as our ABC that is to the Left, they are quite complimentary about what is going on in Conservative UK. http://www.bbc.com/news/business-36956418. I think, like others, that there is an interesting point for discussion between the Brexit vote and the election of the man they now call ‘the Donald’. It is now apparent that the rural non college educated people got Trump over the line. In the UK if you look at the maps of who voted for what, it was the industrial centre and north (from memory) who voted to leave and the south who voted to stay. A colleague of mine in the UK believes that the ‘leave’ vote was influenced by the ‘working class’ less educated who feel (felt) a loss of identity within the EU and did not want their future determined by Brussels. Are there lessons for us here in Australia? You bet there are and it’s about time the analysts and those seen to be the privileged by the not so privileged realised that Australians voted for Hanson’s Party and the signs are all there that more will do so next time. Why? Because the ‘elite’ both in government and in opposition are boring people with their bickering and silly squabbles and these are made infinitely worse by the media and we have just seen how wrong both the media and the intelligentsia and would-be opinion leaders can be and ‘the people’ are sick of it and them. Thanks Roger. That’s an interesting article from the BBC. We’re in agreement about who voted for Brexit. I stand by my judgement that those groups will be made worse off by it, once its effects have been bedded down. That’s worse off than they would have been in the absence of Brexit, which is not the same as a before vs after comparison. Of course, we won’t be able to observe what would have happened in the absence of Brexit, so there will be plenty of scope for disagreement, even after Brexit has occured. Here again, another mistaken assumption by Pannell. Apparently it was the ignorant majority (of which I am one) that voted for Brexit, and people like him (intelligent, educated, sophisticated, civilised) who REALLY understood the issues would have voted to remain. Aussies really should be cautious about commenting on things in other parts of the world that they know nothing about, especially academics, who have the fatal weakness of thinking they know it all. I was in England for the five weeks leading up to the Brexit vote, so I got to hear the campaigns and debates in all their glory. Being an outsider with nothing to gain or lose from Brexit actually puts me in a good position to comment, I reckon. To me the most striking thing about the campaigns was the lies and distortions of the Brexit campaign. They knew that much of the information they were putting out was quite misleading, often by omission, but sometimes by clear errors. It was quite obviously so if you paid attention to the relatively independent expert commentators, rather than the partisan campaigners. But they maintained their campaign strategy because it was influencing people. It was a disturbing prelude to the even more numerous and brazen lies of the Trump campaign (continued now in office). Jos is trying to employ an age-old strategy much used in political debates – dismissing arguments that you disagree with on the basis of claimed flaws in the characters or values of your opponents, rather than addressing the arguments themselves. My observation would be that this strategy is usually not effective in changing people’s minds. It only resonates with people who already agree with you. Interesting topic. Your readers should note that your chart shows shows wealth inequality rather than income inequality. 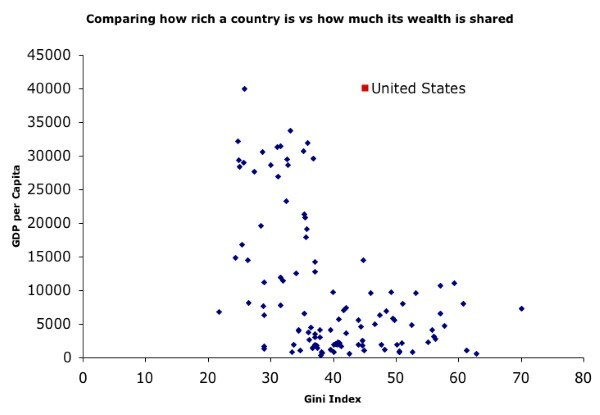 The OECD notes that the Gini coefficient is not a good measure of wealth inequality, because in most countries there is a large share of households with zero or low wealth (http://www.oecd.org/std/household-wealth-inequality-across-OECD-countries-OECDSB21.pdf). Furthermore, measures of wealth may exclude family firms or the super rich who leave the country to avoid taxes. For example, while Sweden is considered to be almost an ideal country in terms of income distribution, its wealth distribution is almost as skewed as the USA. This is due in part to one person, the owner of Ikea. Wealth inequality is much larger than income inequality. There is obviously a correlation between the two measures, and this correlation varies from country to country. In Australia the correlation is fairly low by OECD standards. These distinctions have implications for policy, such as taxing income as opposed to wealth. While Trump’s supporters may have felt they were missing out, it is not clear that his policies will address these problems. In fact, they may make them worse. The next four years will be interesting for economists to observe. Where is the share button in this site?